Tool to decrypt/encrypt with Chinese/Samurai code. Chinese code uses vertical and horizontal lines that cross to encode letters according to the position of the vowels and consonants in the alphabet. Team dCode likes feedback and relevant comments; to get an answer give an email (not published). It is thanks to you that dCode has the best Chinese Code tool. Thank you. > [News]: Discover the next version of dCode Chinese Code! How to encrypt using Chinese Code cipher? 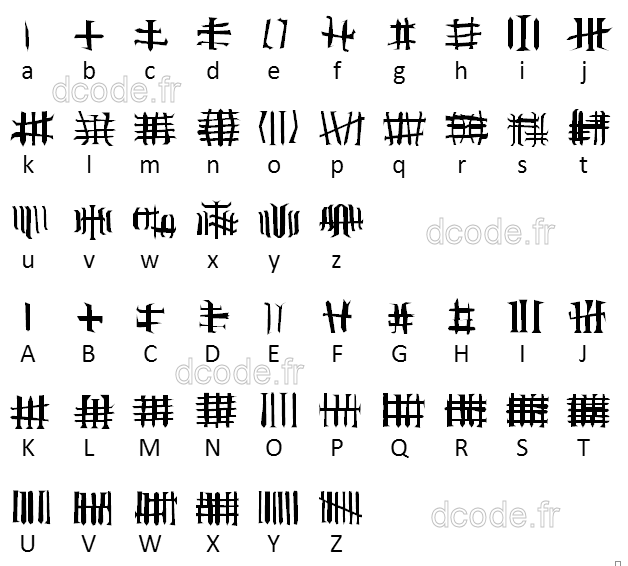 Encryption with chinese code uses the positions (ranks) of vowels and consonants in the alphabet. In the original chinese code cipher, the horizontal bars represent the vowels : A (1 bar), E (2 bars), I (3 bars), O (4 bars), U (5 bars), Y (6 bars) and vertical bars represent the number of consonants that follow the vowel in the alphabet. Example: To code C, which is the 2nd consonant following the vowel A, use 1 horizontal bar (A is the first vowel) and 2 vertical bars. Example: To code L, which is the 3rd consonant following the vowel I, use 3 horizontal bars (I is the 3rd vowel) and 3 vertical bars. How to decrypt Chinese Code cipher? Count the number of horizontal and vertical lines. The number of horizontal lines represent the vowels: A, E, I, O, U, Y then the number of vertical lines is used for the number of consonants following the vowel. The Samurai variant swap the vertical and horizontal lines. How to recognize Chinese Code ciphertext? The ciphered message is made of horizontal and vertical bars/lines/sticks. It is often used by scouts. References to China, Samurai or Mandarin are clues. What are the variants of the Chinese Code cipher? It is possible to switch vertical and horizontal lines in order that the represent consonants and vowels or the opposite. Improve the Chinese Code page!